[0:09] <halabund> How can I get a live preview with the raspberry pi camera? I thought raspistill —preview -v -o out.jpg should do it, but I just can’t get it to give a graphical preview. [0:15] <halabund> I got disconnected for while (bad wifi), did I miss any replies? [0:25] <CarlFK> usb from pi to android phone, enable tethering, ip a shows usb0, but no IP. reboot pi, still no ip. sudo dhclient usb0 - now I have an IP. any ideas how to make the dhcp auto happen ? [0:45] <shiftplusone> I haven't checked in a long time, but it used to be either one or the other, but not usb. [0:48] <shiftplusone> physical pin 12, right? [0:49] <shiftplusone> what do you get it if you short it to ground? [0:58] <shiftplusone> It won't instantly kill your pi or anything, but you should add a voltage divider there. 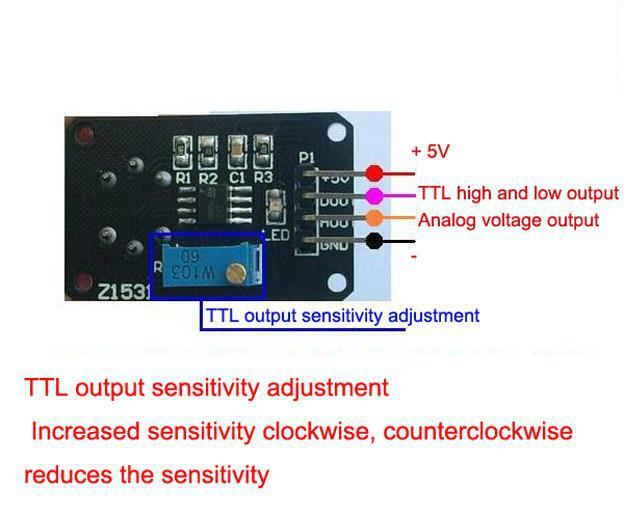 Do you have a multimeter to look at the TTL output? [0:58] <shiftplusone> maybe it's active low. [1:00] <neredsenvy> shiftplusone: http://www.dhresource.com/albu_182343825_00-1.0x0/ems-10pcs-lot-f57-arduino-mq2-smoke-lpg-co.jpg Looking at this picture is digital pin on sensor used to control the sensor and only way to read is to use analog pin ? [1:03] <shiftplusone> I don't know how you'd go about calibrating it other than looking at ttl output and analog side by side and adjusting the trimpot until ttl is active when you need it to be, yeah. [1:04] <shiftplusone> yeah, that's all good. [1:10] <shiftplusone> though you should really get a voltage divider on there. you're killing your pi. [1:11] <neredsenvy> Would a resistor help ? [1:11] <shiftplusone> do you have a 2.2k and a 3.3k? [1:28] <shiftplusone> the 3.3k resistor does not go between the ground pins. You want the grounds connected directly. [1:29] <shiftplusone> but if you just want something that 'works' and don't care about the wellbeing of your pi then your initial setup is fine. [1:29] <shiftplusone> I'm just saying what the correct method, as I understand it, is. [1:44] <shiftplusone> where the green wire from 'tx' connects to the resistor. From there to ground. [1:44] <shiftplusone> and the blue wire from the sensor goes to ground, without a resistor. [1:49] <shiftplusone> pragmatism, deleted from where? [1:49] <shiftplusone> an actual file or just unset it in the environment? [5:22] <Jon30> can someone recommend me a decent controller for NES games that works with raspberry pi? [6:22] <shiftplusone> or am I missing something? [6:23] <Lacriatch> You can't hardware lock a cloud server. [6:26] <Lacriatch> kieppie: Give up. Use client side encryption. [6:26] <Lacriatch> Then it doesn't matter where you store the data, as long as you keep the keys secure (in a Yubikey for example). [6:28] <[Saint]> I just use 2-factor auth. [6:28] <[Saint]> I literally couldn't care less if someone got my passwords. [6:29] <[Saint]> It's only one half of the solution. [6:30] <[Saint]> Only I can unlock my phone, and only my phone can generate 2-factor keys, so if anyone gets the password for <service>...well, good on them. [6:30] <[Saint]> They still won't be able to log in. [6:31] <[Saint]> SSH, the googlesphere, and any social media worth its salt does...so, I'm set. [6:31] <[Saint]> For most other applications there's bolt-and-go additions, also. [6:32] <[Saint]> Don't use 'em, 'cos...asshats. [6:33] <[Saint]> I will join in on that bandwagon and state that kieppie is surely overthinking this, however. [6:33] <[Saint]> Security is great. [6:33] <[Saint]> But it sounds as though you're going to make your life Hell in the process. [6:33] <[Saint]> FOr little additional gain. [6:36] <[Saint]> shiftplusone: doesn't PayPal still offer SMS based 2FA for confirmed numbers? [6:37] <Lacriatch> I use Bitcasa myself but I'm not sure how much I trust them. [6:39] <shiftplusone> US services tend to wait for you to fill in a few forms and then tell you at the very end that they don't offer the service. [6:40] <[Saint]> Their advisory page doesn't state this. [6:42] <[Saint]> Releasing source for 2FA implementations is rather counterintuitive. [6:44] <Lacriatch> kieppie: Their API is open, you can write your own client if you want. [6:46] <shiftplusone> kieppie, not a US only thing. [6:46] <[Saint]> shiftplusone: so - the SMS 2FA isn't geofenced? [6:47] * [Saint] calls BS on that. [6:48] <[Saint]> Ah, no need - Ms. [Saint] has an account. [6:48] <[Saint]> Yep. There we go. [6:49] <[Saint]> So, yeah, someone told you a bunch of lies. [6:51] <[Saint]> It took me like 20s to set up on Ms. [Saint]'s account. [6:52] <[Saint]> And I'm not doing any magic to make it appear that I'm in any other locale. [9:35] <overrider> I have been powering my RPI by soldering wires directly to F3 and D17. So far, no issues really, except that should an RPI break its not easy to replace without cutting and resoldering wires. [9:36] <overrider> Whats a better way to power the RPI without bypassing the polyfuse but still somehow permanent without the usb power adapter? [9:37] <shiftplusone> what about getting a microusb plug and soldering wires onto that? [9:49] <Duality> and i get an error where my comments are in my source ..
[9:50] <Duality> so anyone else worked with this tutorial before or knows what is happening ? [9:52] <shiftplusone> I just looked at wikipedia and it looks like GAS is strange. [9:55] <shiftplusone> It's not like ; has some reserved meaning in ARM assembly, does it? [9:56] <Duality> not that i know of. [9:56] * shiftplusone adds another point in fasmarm's favour. [9:58] <shiftplusone> Duality, by the way, do you have a usb serial adapter? [9:59] <shiftplusone> I suppose you can use uboot to load the kernel over the network, but I think it's too much of a pain. [10:00] <shiftplusone> Can't be used to load large kernels like linux though. [10:01] <Duality> shiftplusone: max size ? [10:11] <shiftplusone> Triffid_Hunter, it's for bare metal kernels, not for linux and such. [10:16] <shiftplusone> threw a voltage divider on the rx? [10:21] <Duality> peripherals doc ? [10:21] <shiftplusone> the tutorial is a bit bad about this...... "I've read the manual, and I know you need to plug this value into this address. I'm not going to explain it though"
[10:21] <Duality> shiftplusone: yea :) what does the value meen ? and how is it derived ? [10:30] <shiftplusone> Then if you look at the GPIO section, you will see that all of the GPIO registers start from "0x7E200000". Then we convert it to the other memory map and that becomes "0x20200000"
[10:30] <shiftplusone> Coming back to the tutorial, the first instruction is "ldr r0,=0x20200000"
[10:30] <shiftplusone> So you load the base of all of the GPIO stuff into register 0. [10:34] <Duality> shiftplusone: i get it now :) that made alot of sense ! [10:36] <shiftplusone> Yeah, I feel like omitting that information over-complicates the tutorial rather than simplifies it. [10:49] <shiftplusone> then get a prompt up and make some BASIC-like thing. [10:50] <Duality> like a c64 :D ? [10:50] <shiftplusone> do you have one? [10:50] <Duality> no :( but they are expensive here ! [10:51] <shiftplusone> where is here? [10:51] <Duality> where are you from :)? [10:57] <Duality> shiftplusone: i don't mind getting a broken one an fixing it though. [11:13] <tanuva> I've ordered a Sundtek usb dvb-c tuner. Does anyone know if decoding of hd channels (is | can be) done in hardware? [11:33] <tanuva> Referring to my question? Yes, true. But the tutorial I read didn't mention an mpeg2 decoder license, so I suspected them not using the gpu for that. [12:00] <basss> hello, i have a corrupt raspbmc machine that i would like to force fsck on boot. how can i do so ? [12:01] <CharlieBra7o> basss: do u hav another linux machine or a live cd/usb? [12:03] <shiftplusone> then raspbmc might be stupid. [12:09] <CharlieBra7o> I think the "data partition" is FAT32, isnt it? [12:44] <CharlieBra7o> basss: any luck? [12:45] <basss> CharlieBra7o: its stuck in the loop "Relax, XBMC will restart shortly"
[12:46] <CharlieBra7o> doesnt that mean the boot (into the os) was successful? [12:50] <basss> didn't work out for u as well ? [12:51] <CharlieBra7o> what do u mean? [12:53] <basss> CharlieBra7o: how can i downgrade ? [15:07] <Lacriatch> Bam. Problem solved. [15:09] <Lacriatch> On a less provocative note, what's the best way to package a Pi and extra attached boards? [15:10] <IT_Sean> Most cases do not handle add on boards, due to the wide variety therein. [15:22] <IT_Sean> Is this for a permanent install, or a portable application? [19:52] <pragmatism> I've written a script that gets a permission denied error when trying to open /sys/class/gpio/gpio2/direction. How can I give my script access to that file? [19:53] <gordonDrogon> pragmatism, it needs to be run as root, alternatively use the gpio program that's part of wiringPi to set the export and direction. [19:54] <pragmatism> gordonDrogon: Damn, oh well. Thanks! [19:54] <gordonDrogon> pragmatism, you might be able to change ownership - but again, that needs to be done as root. [22:15] <plugwash> The analog audio on the Pi is pretty poor, USB can be an option but i've seen lots of reports of problems with USB sound cards on the Pi. [22:16] <jarrz> plugwash: is the wolfson audio card sufficient for speakers like the rokit 5 g3? [22:22] <SpeedEvil> I don't recommend the wolfson card. It sheds all over the place, and ate my mouse. [22:23] <jarrz> Encrypt: Yea.. It does seem like a good solution. In it’s manual it describes the 3.5 mm stereo output as of “being an ‘acceptable’ quality level”. How would it compare to a 3.5 mm stereo output of a 2008 macbook quality level wise? [22:25] <IT_Sean> or beerholder, as the case may be. [22:28] <shiftplusone> If you want it to sound better, find a source that sells it for more and uses words like 'crisp' and 'vibrant' to describe it. [22:36] <Demon_Jester> Hey guys if I clone my sd card from the rpi does it save the files, and packages too? [22:44] <Yohio> follow-up question to his question: can I clone my 8GB card to a 32GB card and then enlarge the partition from RPi? [22:48] <shiftplusone> Yohio, NOOBS and raspbian are not mutually exclusive. In any case, you can resize it, it's just easier if it's a regular raw image without NOOBS.